On first glance the Maxtech 50204MX & 51643MX Spade-Max Pro Spade Bit Sets might appear to be run of the mill spade bits, but upon closer inspection there are some key differences. Using these bits makes drilling medium sized holes a breeze thanks to a steep rake angle on the leading cutting edge that provides a faster and cleaner cut. The slightly less expensive 9-piece set includes a 1/4″ hex drive Load N’ Drive quick connect collet that is super compact and has a spring loaded bit-eject mechanism. With 1/4″ quick connect hex shanks and a rust resistant black oxide coating, we suspect that if you pick up a set of these you will be able to use them for a long time. The Maxtech 50204MX & 51643MX Spade-Max Pro Spade Bit Sets came sealed in clear plastic retail packages with the cases opened inside to display the bits. The 50204MX 11-piece set comes in a hard plastic clam shell style case. It is worth noting that the case is pretty decent with its rubber overmold and secure bit retention system on the inside. The case has a strong hinge that will hold up to lots of use and our only gripe is that the latch is a little stiff and hard to lock closed. This set includes 10 regular length bits: 3/8″, 1/2″, 9/16″, 5/8″, 3/4″, 7/8″, 1″, 1-1/8″ and 1-1/2″ and two stubby bits in 3/4″ and 1″. The stubby bits are handy because they are designed so that when there is a stud space with double studs or other tight spots; you can still drill a nice perpendicular hole. The 51643MX nine-piece set comes in a nice heavy duty nylon fold up case that has has pockets on the inside to hold each of the bits securely. A flap of nylon material covers the top of the bits and makes it so that the bits won’t slide out of the top of the case. The 9-piece set includes 3/8″, 1/2″, 9/16″, 5/8″, 3/4″, 7/8″ and 1″ regular spade bits and one 1″ stubby bit. What makes the 9-piece set cool is the Load N’ Drive quick connect collet which makes changing bits a breeze. You can simply keep the collet loaded in your drill and any 1/4″ hex drive bit will fit into it. Now for the technical side of the bits. “What makes these different?”, you are probably wondering. Well, the big difference is the steep rake angle of the leading cutting tips. With the steep angle, the bit acts more like a chisel as it cuts its way into the wood. In fact, it quickly chips out “chunks” of wood. Now the thing to notice is that, with the outside tips cutting before the inside part of the cutting blades, you get a cleaner hole and less splintering when you get to the backside of your board. The whole idea of spades bits is for quickly boring through wood, so speed is definitely of the essence – and these bits should deliver that. All the bits have deeply stamped measurement markings in the center of the paddle. We appreciated this because there is nothing worse then having to guess at the size of a bit when cheaper etched markings wear off. Testing things like blades and bits is fun and the Maxtech 50204MX & 51643MX Spade-Max Pro Spade Bit Sets were a blast (literally, of wood) to use. Since drilling into a kiln dried 2×4 is too easy, we oped for a fresh (ie. “wet”) pressure treated 4×4. We bore numerous holes with each size and had equal success with all. One of the things that we noticed with the bits was the clean holes that they created. Even when we got to the big 1-1/2″ bit, we did not have any trouble making a clean pass straight though the wood. We also tried many of the different size bits in the Load N’ Drive collet. Given the small size of the collet we were initially a little hesitant to put too much trust in it. After doing a pile of holes, the Load N’ Drive collet proved itself quite well. To swap out bits with the collet you simply pull the rubber overmolded metal sleeve back and the spring-loaded bit actually pops right out. 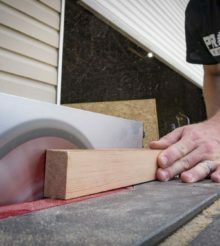 While there are some claims on the packaging to be the fastest cutting bits on the market, after doing some digging we found that this was according to some independent testing about 4 years ago. Now with spade bits on the market that have self-feed screw tips that some companies are making, this claim might need to be reevaluated. At the end of the day, we liked the bits and they were definitely fast and made decently smooth holes. Even with new types of boring drill bits on the market; spade bits still seem to be the standard when it comes to getting through wood quickly. The Maxtech 50204MX & 51643MX Spade-Max Pro Spade Bit Sets are a fantastic way to go if you are looking for some quality bits that offer both speed and nice holes. Whether you’re a contractor, electrician, plumber, or even a do-it-yourself type, these sets are a good choice. For our Performance rating, we give the Maxtech Spade-Max Pro Spade Bit sets an 8/10 because they offered a whole package that had quality storage cases, black oxide treated metal and a fast cutting rake angle. For our Value rating, we also gave this set a well deserved 8/10 because, when you break it down, the bits cost less then three bucks each and that is a deal when you are talking about quality accessories.